John DeMain will participate in Blue from 06/10/19 through 08/22/19 (Glimmerglass Opera). 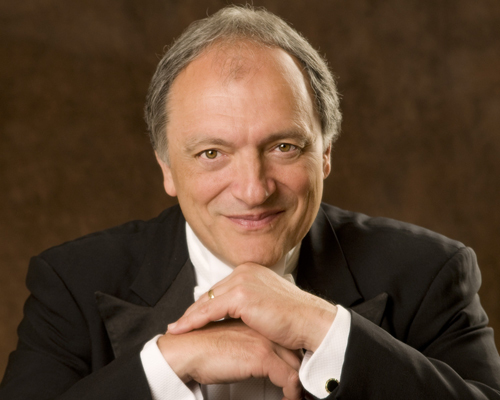 Celebrating his Twentieth-Fifth Year as Music Director of the Madison Symphony Orchestra and Artistic Director of Madison Opera, Grammy and Tony Award-winning conductor John DeMain is noted for his dynamic performances on concert and opera stages throughout the world. Jake Heggie, just one of the outstanding American composers with whom DeMain has collaborated, recently assessed the conductor’s broad appeal, saying, “There’s no one like John DeMain. In my opinion, he’s one of the top conductors in the world.” During his tenure in Madison, DeMain has raised the quality of the Symphony by introducing the industry standard of blind auditions, overseeing the move into the world-class Overture Hall, expanding the subscription season to triple performances, and expanded the repertoire to include ever more challenging and virtuosic works. His active guest conducting schedule has taken him to the stages of the National Symphony, St. Paul Chamber Orchestra, the symphonies of Seattle, St. Louis, Pittsburgh, Detroit, Houston, San Antonio, Long Beach, Columbus (Ohio), Jacksonville, along with the Pacific Symphony, Boston Pops, Aspen Chamber Orchestra, London Sinfonietta, Orchestra of Seville, the Leipzig MDR Sinfonieorchester, Mexico’s Orquesta Sinfónica Nacional. DeMain also served as Artistic Director for Opera Pacific, where he led an unprecedented seven-company co-production of Jake Heggie's Dead Man Walking in 2002. He has also been a regular guest conductor with Washington National Opera at the Kennedy Center (Susannah, Porgy and Bess and Show Boat), New York City Opera, Michigan Opera Theatre, Los Angeles Opera, Seattle Opera, San Francisco Opera, Vancouver Opera, Virginia Opera, Lyric Opera of Chicago, the Glimmerglass Festival, Portland Opera, and Mexico’s National Opera. his past season, he conducted Carmen and Florencia en el Amazonas for Madison Opera, a gala concert for the Washington National Opera, a revival of Porgy and Bess for Seattle Opera plus concerts with Madison Symphony. Next season, he will debut at the Teatro Liceu in Barcelona Spain conducting Bernstein’s Candide, and return to Madison to conduct A Little Night Music and Rusalka plus concerts with the Madison Symphony, including Mahler’s monumental Symphony No. 8 (Symphony of a Thousand). Mr. DeMain enjoyed a distinguished 17-year tenure with Houston Grand Opera conducting a wide spectrum of the standard operatic repertoire. He also led a history-making production of Porgy and Bess, winning a Grammy Award, Tony Award and France’s Grand Prix du Disque for the RCA recording. In all, he has conducted more than 350 performances of Porgy and Bess throughout the world. His critically acclaimed New York City Opera production of the opera was televised on National Public Television’s acclaimed Live from Lincoln Center series and garnered an Emmy nomination for “Outstanding Classical Music & Dance Program.” The series also presented DeMain’s productions of An American Christmas with James Earl Jones, Floyd’s Willie Stark, Joplin’s Treemonisha, Adams’ Nixon in China and Plácido Domingo & Friends. His contributions to the series were celebrated in its 2006 30th Anniversary Broadcast, which featured excerpts of his New York City Opera Porgy and Bess performance and of “No Puede ser” with Plácido Domingo, with whom he has worked extensively in concerts throughout the world, most notably in the celebrated 1992 Concert for the Planet Earth from Rio de Janeiro. At Houston, DeMain was invited by Leonard Bernstein to conduct the world premiere of the composer's last opera, A Quiet Place, and DeMain has since conducted the world premieres of John Adams’ Nixon in China, Carlisle Floyd’s Willie Stark and The Passion of Jonathan Wade, and Sir Michael Tippet’s New Year. DeMain began his career as a pianist and conductor in his native Youngstown, Ohio. He earned his bachelor’s and master’s degrees at The Juilliard School in New York City and went on to make a highly acclaimed debut with the Pittsburgh Symphony Orchestra. DeMain was the second recipient of the Julius Rudel Award at New York City Opera and one of the first six conductors to receive the Exxon/National Endowment for the Arts Conductor Fellowship—for his work with the St. Paul Chamber Orchestra. DeMain holds honorary degrees from the University of Nebraska and Edgewood College and he is a Fellow of the Wisconsin Academy of Sciences, Arts and Letters. He resides in Madison with his wife Barbara and their daughter Jennifer.